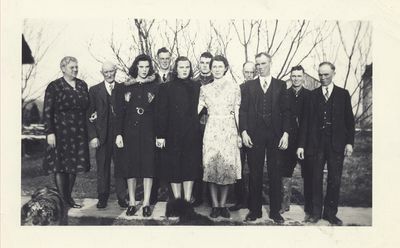 The Allan Dixon family in 1940 at Limestone Hall, home of Lorne and Laura Dixon, and Guy Dixon, Lot 8, Concession 5, Nelson Township. This is just northeast of Lowville, close to Britannia and Walkers Line. Left to right; Jean (Alderson) Dixon, William McLean, Priscilla Dixon, John Dixon, Margaret Dixon, Fred Dixon, Laura (Prudham) Dixon, Guy Dixon, Lorne Dixon, Arthur Coulson, Allan Dixon. Allen, Guy, George, and Lorne Dixon were brothers, sons of William Anson and Priscilla Hume Dixon of Limestone Hall. The photograph was taken by the boys' sister, Jennie Mae. Information from Ruth Dixon Taylor. The Dixon family lived at Limestone Hall until the mid-1960's. Well-known broadcaster Betty Kennedy and her husband, G. Allan Burton lived there for many years. A link to the Archeion Archives Association of Ontario is provided in this record under the photograph so you can look at their 3 photographs of Limestone Hall.